UJam's software helps those without any musical training or skill compose professional-sounding songs. NEW YORK (CNNMoney) -- What if you could turn that tune in your head into a studio-quality piece of music, without any musical training, skills or even talent? Enter UJam, a startup that wants to give everyday people that opportunity. 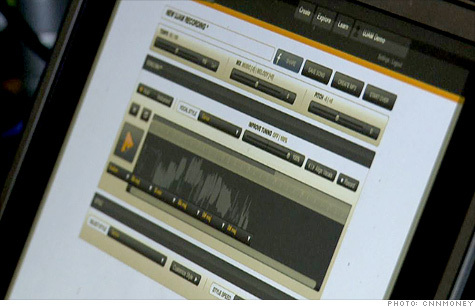 The site lets users hum, whistle, or sing into their computer's built-in microphone. In a couple of clicks, the service transforms the recording into a well-produced song. Users can turn their whistling into a Hollywood theme tune -- or an orchestra-backed power ballad. UJam is the brainchild of film composer and music producer Hans Zimmer, musician Pharrell Williams, and Peter Gorges, who has spent his career fusing the music and technology fields. "The three of us, we just had this idea -- how could these guys give back something to their audience and their fans?" Gorges said. "Digital cameras changed photography forever. It made it easy for everyone to take photos. Our goal was to make music so easy it becomes an everyday thing for people to share songs." While the interface of UJam seems very basic, it's the technology behind the site that sets it apart from many traditional music synthesizers. "I had done professional music technology for years, and I wanted to do something more broad, more for the consumer," Gorges said. Users choose from more than 85 professionally produced music styles -- everything from bluegrass to rock n' roll -- to pair with their recordings. UJam creates harmonies that accompany those recordings and offers up an array of other options: You can transform your whistling or humming into guitar strumming, or adjust its pitch, temp, and tuning. "We wanted to make sure however simple your input is, our output sounds professional," Gorges said. Since demoing at the TechCrunch Disrupt conference a year ago, the self-funded Bremen, Germany-based venture has been fine-tuning its app. Down the road, UJam plans to commercialize its technology by offering up a premium model with additional instruments and various features. UJAM is still officially in "alpha" testing. Around 50,000 people have already signed up and begun playing with the system. The crew is currently working on making UJam mobile and social, letting users create and distribute their music through social networks. They're also experimenting with ways to let people who don't want to perform their own songs toy with music creation. "We're looking at people [who] are very embarrassed to sing," Gorges said. "What other forms of input can we give people, how can we give them access to our server without having to sing songs?"